Stirring the lees adds flavour to wine, watch it here in action! I have no idea how many times I’ve used the term “stirring the lees” and some of you might think oh here she goes again, talking that wine gobbledegook nonsense. Finally I’ve seen it in action, thanks to a peekaboo glass side to an oak barrel. You’re also thinking, well I’m pleased for you Jane, now you’ve seen that stirring thing in action, but what has that got to do with me? Well, if you’ve ever had a glass of wine (or two) ever, ever, ever, then the wine might have had a touch of lees stirring before it finished its journey on this earth to be clutched by you. Château La Louvière is in the heart of the Pessac-Léognan AOC in Bordeaux, which is renowned for its white wines, and we were shown round the winery by Vincent Cruège, the director of exterior relations. It is there we stirred the lees but more of that in a minute. Stirring the lees: What is the role of yeast? Yeast converts the sugars in grape must into alcohol. Ok, ok, more gobbledegook right there – let me start again. The must can be the juices, skins and pulp from the harvested grapes. It contains natural sugars and the yeast is added to the must and then the yeast gets greedy and giddy, consumes the sugars, the by-product is alcohol, and eventually the yeast dies. The majority of the time winemakers will add a specific yeast to the must which they know will react in a certain way to give them the style of wine they want. This is called innoculation. 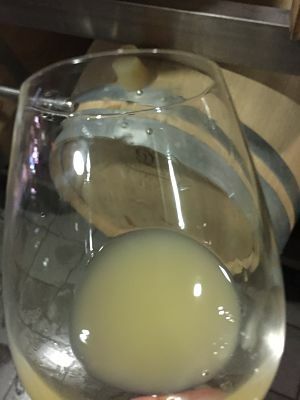 Sometimes winemakers will rely on the yeasts naturally occurring on the skins of the grapes and in the winery’s atmosphere as the catalyst of their fermentation. There are technical risks to producing wines like that, but wines from this so-called wild ferment can be very expressive and interesting. The glass above might not look very exciting, but I was excited, yes indeedy. This is yeast doing its job, right there, right then, in sauvignon blanc grapes harvested at the Château La Louvière vineyards just a week before my visit. This “wine in progress” from grapes grown on clay had already developed delightful aromas of tropical fruits. Pineapple chunks, I kept saying. Nobody paid me any attention, no doubt thinking I was the mad Northern bird in the corner and it was best to leave me alone. Stirring the lees: What is this lees thing then? Right. So I’ve mentioned the yeast dies when it has converted all the sugar into alcohol. But bear with me on this, because I’m just going to go off at a tangent. Sometimes the winemaker decides they don’t WANT the yeast to have all the sugar to itself and those clever wine expert people want to SAVE some of the sugary sweetness for us to enjoy in our glasses of wine. They’ll kill the yeast (there’s a handful of techniques) in the middle of its sugar-flurry, which means some of the natural sweetness of the grapes still remains in the wine and the winemaker can now develop the style of wine they want with the level of sweetness they want. When do they do this? Well, in port for one. That’s why port is so sweet – but it is high in alcohol because it is fortified with high levels of alcohol which kills off the yeast before it has chance to guzzle all the natural sugars. Back to the theme: The dead yeast cells fall to the bottom of the fermentation vessel (which could be stainless steel, new oak, old oak, or even concerete). Whatever the container, the dead yeast cells have nowhere to go but down. Once there they could be mingling with small particles of pulp, grape skin and other tiny, tiny, molecules from the fermentation process. This little gathering is called the lees. Hurrah, I got there in the end. Have a look at this very quick Instagram clip before I tell you what’s going on here. I’m very grateful to Mary Dardenne from decantertours.com who had the wherewithal to capture Vincent Cruège stirring the lees as I faffed around on the left getting nowhere. Don’t blink, don’t look at me, just press play and look through the glass on the side of the barrel. Stirring the lees: Why do winemakers want to mix it all up? You’ve seen it now, all that swirling and stirring and floaty bits in their whirlpool of wine. There was even a special metal gadget to do the deed, which looked like a very long kebab skewer. The deed has a name – lees stirring is known as bâtonnage. But why go to all the trouble? Well, flavour my friends, and that thing called “mouth feel” which is a touch of creaminess. The cells in the lees have kind of gone “phew” and “pop” and are releasing their molecules into the wine. Which is great for the wine at the bottom of the vessel, soaking up all the goodness like a German on a sunbed, but the wine at the top is looking down and saying, hey, what about me! That’s why people like Vincent come along, and the scores of winemakers and experts across the winemaking globe, and stir it up a bit. There’s several ways this can happen – the “kebab stick” is just one. There’s also some technical reasons why the lees is stirred, one being that if it isn’t then the wine sitting on top of it can develop unpleasant chemical aromas similar to cabbage. Stirring the lees: Does this happen to every wine? One of the things I love about the world of wine is that there are so many techniques available to a winemaker. Just think British Bake Off – in the technical challenge the bakers have the same ingredients but are doing things in slightly different ways. If you put two winemakers in a winery with the same raw ingredients they’re likely to make different decisions to create a wine in their preferred style. Lees stirring is one of those things. Some wines are racked off the lees fairly soon after completion of fermentation, to retain a fresher, crisper wine, untouched by the complexities of the lees. 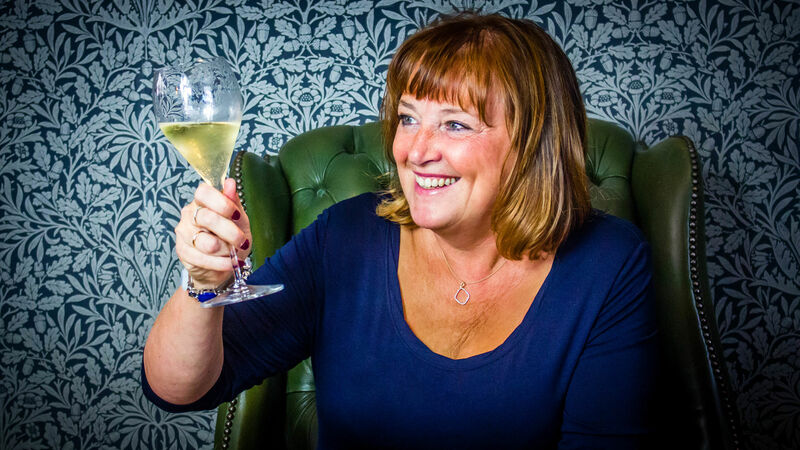 I’ve simplifed a broad subject here – but next time you perceive a wine has a creamy sensation, then it might just have had a touch of lees contact. There you go. I visited Bordeaux in a press trip hosted by the Bordeaux Wine Council (the CIVB) and our guide was Mary Dardenne from decantertours.com. Previous PostPrevious Wines of Australia: Five wines you might not expect to see from Down Under!